So why are we wasting billions on these motorways? Several commentators, including Luke Malpass and John Roughan, have complained about spending by the New Zealand taxpayer on KiwiRail. The suggestion, albeit often somewhat veiled, is that our rail operation should stand on its own as a commercial operation. But such people seem to have completely missed two factors that destroy their arguments. The first is that any rail operation is as much part of the transportation infrastructure as the roads. The second is that our road network (and its use by motorists) is subsidised much more heavily than rail. I acknowledge that rail does lend itself to privatisation more than roads. As some of us remember, the Labour government of the 1980s did privatise rail. Perhaps not so well known is that the operation was virtually asset-stripped by its private owners. It is tempting to blast those owners for short-term thinking and/or poor planning and there might be at least some justification for that response. But I believe there was another factor at play. In the economic environment of the time, most of the rail operation could only be commercially viable if its assets were stripped and/or run into the ground. This all raises the question: is it better to subsidise our rail operation to keep it viable, or leave it to make its own way in the market (and almost certainly be run into the ground on all but a few routes in high demand)? It may only be worth leaving rail to its own devices if we are giving it a “level playing field” to compete in. But we certainly don’t in this country. Our road network and road users are, and have always been, much more heavily subsidised. A report commissioned by the New Zealand Transport Agency (October 2009) found a shortfall of $1.5 billion a year between what is collected from users of our state highway network and what is being spent on it. That shortfall, made up by taxpayers, is already several times what is proposed to be spent on the rail operation and is far from the only taxpayer subsidy given to roads. Our local road network is also heavily subsidised through local authority rates – about another $1 billion a year. There are the “externalities” – road trauma, health problems caused by air pollution, noise, loss of amenity, severance of communities and damage to the environment (including greenhouse gas emissions, which have increased by more than 70 per cent since 1990). Those costs are either funded by the taxpayer or individuals (particularly the owners of land alongside busy roads) or they are essentially withdrawn from “our” environmental bank account. Such costs amount to many more billions of dollars. Road trauma alone is estimated to have a “social cost” of more than $3.5 billion a year. Some is funded by ACC levies, the rest by taxpayers and individuals who weren’t directly involved in the crashes. Also, motor vehicle pollution is estimated to kill about the same number of people as road crashes. Despite the high subsidies our roads already receive, our Government is planning to spend some $21 billion on road upgrading, more than half of which is earmarked for “roads of national significance”. Is this a more effective use of taxpayer funds than the few hundred million some are complaining about rail receiving? I think not. I have examined the trends at traffic count sites near the Government’s seven “roads of national significance”. 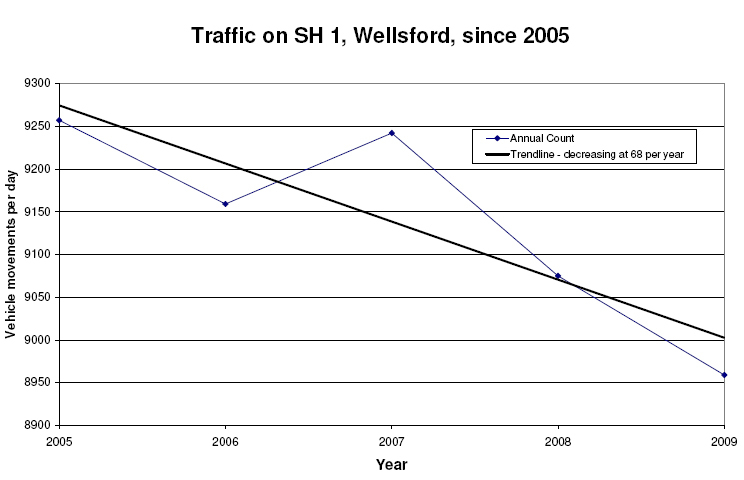 I found that, since 2005, the traffic at three of the locations have been trending downwards. At the other four, the growth is well below what NZTA states is the average for the regions in which the roads are located. 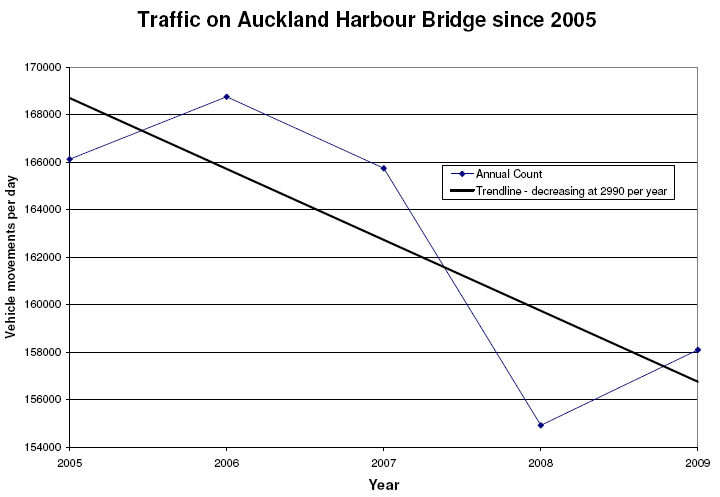 The Auckland Harbour Bridge is particularly interesting; since 2005, its traffic has been trending downwards by an average of more than one million movements each year. Even if those routes were all experiencing high and positive traffic growth, any good traffic engineer would tell you it’s probably a waste of money upgrading them anyway. Upgraded roads almost always attract traffic from other routes, and/or trips that wouldn’t have been made during congested periods. This is known as “triple convergence”. It causes most upgraded road routes to become congested again within a relatively short time. It’s time for people criticising the Government funding of our rail operation to turn their attention to the much larger sums being wasted on our roads. * Dean Scanlen is a professional transport engineer based in Whangarei. Scanlen’s examination of the traffic volumes along SH1 north of Auckland (where the holiday highway is proposed), on the Harbour Bridge and on State Highway 16 show some very interesting results: The holiday highway has been costed at around $1.6 billion, another harbour crossing might be $4 billion and widening the Northwest Motorway is costing $800 million. That’s an absolutely HUGE amount of cash proposed to be spent on roads where the traffic volumes are falling. A lot of people do remember the Labour government privatising rail in the ’80s, which is odd, because it was actually privatised by National in 1993. Yes you’re right Steve. I picked that up in the paper version too – the article is still very good though. YOu can be guaranteed if those projects are completed, the graph will go upwards, people will flock to these new ways of transport and the motorways will create what they set out to fix, congestion. I have noticed lately that there have been a number of comments to the Herald from all over the city calling for more investment in rail yet almost no one is calling for more motorways. This has made me think that there is probably a majority of people who would support better PT spending yet because there is no effective PT lobby group nothing really happens. I would love to see a proper survey done on Aucklanders to see what they would prefer the transport money spent on as i’m pretty sure that by now most people know that building more lanes on a motorway doesn’t solve anything and the congestion will be just as bad as before. So how do you create an effective lobby group or get a proper survey done? That is what I don’t know, a lobby group needs money and the problem is who is going to pay for it? On the roading side you have AA and also the trucking businesses that pay levies to the likes of the Road Transport Forum. The CBT has been good so far but as far as I am aware it just doesn’t have the funds to really be as effective as it could, part of the problem is that for most people want to receive a service for the money they pay. The AA for example is able to offer services at a commercial rate creating a viable business and use the profits for its lobbying efforts. Perhaps the CBT needs a recruitment drive so to speak, some way increase the donations and to focus the thoughts of the scattered masses. and like I said on a previous thread, where is our Peter Newman, someone doing the research to refute the claims of some politicians and the road lobbys. Lots of PT supporters are quite restricted in their ability to be vocal because of their employment. We really need a strong supporter based at a university or somewhere they can say whatever the heck they like. There’s “TRANS-ACTION” in Wellington, but they are pretty focussed on Wellington and Trams. Pardon me, which precise NZTA report is Dean Scanlen referring to? Any help in seeing what Dean is referring to would be appreciated. I’m not quite sure what report that is, my understanding was that NZTA is reasonably self-funding (ignoring hidden subsidies of course). I’d be curious to see it myself too! Well, given the CBT had its largest ever membership in the 09/10 year it would seem more of the general public have realised what it does. Don’t forget the $20 million spend on Onehunga rail was because of the CBT campaign. As it is a voluntary organisation, the more members CBT has, the more energy we gain to push for better transport. Just google “Waikato commuter trains” and you will see how active CBT has become and with a huge increase in members from that region. The AA is a motorists breakdown service which then pretends all its members just want more roads. It never asked me what I want! Can we a do survey of council candidates re:their attitudes to PT? Then we can rate them based upon their answers and past performance. Might be a good way of getting PT on the agenda for the elections. The only way we are going to get AT to act is by helping elect a pro_PT council and mayor! Good points. I guess CBT can say “Watch this space” with regards to whom will do what for public transport. CBT and other Auckland groups are in fact organising something like that for the upcoming Auckland Council elections. But I will let them talk of it when they are ready to roll that out. My information on subsidies came from a report by Rockpoint Corporate Finance. A good summary of the report can be found at http://www.nztransport-logistics.co.nz/home/free-articles/nz-road-transport-funding-15bn-annual-subsidy-to-road-transport-report.html. I read it again yesterday and it occurred to me that I was somewhat careless with some of my wording. Rather than suggesting that $2.5 billion a year is spent on State highways, I should have said that they would lose $1.5 billion a year if run on a purely commercial basis. Even so, that $1.5 billion is still a subsidy. I have estimated the subsidy figure for local roads at roughly half of the $1.9 billion total annual expenditure on them. The remainder is funded by the Government, some of which could well come from the taxpayer as well (but I have assumed not). I didn’t have enough space to mention that, by spending money on roads, we are encouraging even more more burning of fossil fuels. NZ is already a net importer of oil (100,000 barrells a day I believe). Our greenhouse gas emissions are right up there with the highest in the world and then there’s all those oil spills… Any strategy that encourages more car use is, quite simply, insanity. Thanks for dropping by Dean. It’s good that you’ve raised the issue for debate, and it’ll be interesting to see what responses your piece gets. Jon R – I certainly think that the CBT has done a fairly good job of pushing issues although I don’t 100% agree with everything i.e. Waikato trains. More money definitely wouldn’t hurt the cause I imagine. * The agenda of the paper was to find ways of promoting coastal shipping. The problem is that if you do find a way to grow the coastal shipping market, nearly all the traffic will come straight from the railway – not the trucking companies. If the coastal system is struggling for traffic, that is essentially a function of New Zealand’s economic base producing things which aren’t well suited to shipping. * The value of the state highway system was given as $20 bn in depreciated replacement cost (like-for-like) values. This should be compared with the $11.8 bn value placed on the rail network, on what I think is the same basis, and the $600m value for rolling stock and the ferries. *In decision-making terms, though, these have to be regarded as sunk costs. What the ‘commercial’ value of the roading system might be is a good question; what the commercial value of the railway is, is a tiny share of that $12 bn – perhaps $800m – and only just over half the current rail system is actually commercially viable. Fortunately, no-one has yet had the bottle to cut the other half. * So, if these costs are ‘sunk’, they should not come into consideration in terms of deciding whether the system is ‘profitable’. If they did – hence, creating the ‘loss’ on the road system you mention – you would have to do the same for the railway system, making the rail system’s /annual/ loss far greater than it already is. What our governmental process has done, has been to write off both sets of costs, for any practical purpose anyway. * Finally, the state highway system, like the roads network, is one where the trunk supports the branches. If we were pricing road use more accurately, we would probably pay about the same on the main system (SHs 1-8) – and a lot more on everything else. However, that would not help the railway; because the railway doesn’t run there. Also, the main part of the SH system is built, as you would know, with fairly strong pavements, so it would not notice overmuch further heavy trucks. The more lightly-built local roads systems are, of course, another matter. There, a 44-tonne truck does far more damage than the same load around the Port of Auckland. That said, I don’t see the point of the ‘holiday highway’ either – I used to work in Transit NZ’s budgets section and the virtue of the benefit-cost appraisals we did is that it threw out a lot of projects which might have had political support but which really weren’t worth doing. Thanks to both Dean and Ross commenting here. Ross, in response to the State Highway network being built strong enough to accomodate 53 (or more) tonne trucks….well that is very debatable. NZTA have not even researched all their bridges and culverts, let alone pavement surfaces as to whether they can with stand the additional and substantial wear and tear. Last year NZTA threw up a figure of the cost of bridge upgrades would be $80-$100 million (highways alonge). However, after reviewing the report it was clear to be huge underestimation as they had not checked large parts of the highway network. In fact, NZTA had even lost bridge plans of some briges in the Manuwatu! Additionally, they had not reviewed some key bridges on SH north of Auckland, the Harbour Bridge and many on the South Island network. Truth be know, NZTA and the Minister of Transport still have no clue as to the costs, except it is higher than $100 million. Remember NZTA has been getting upgrade costs incredibly wrong, with the Auckland Harbour Bridge upgrade increasing from $45 to about $90 million! 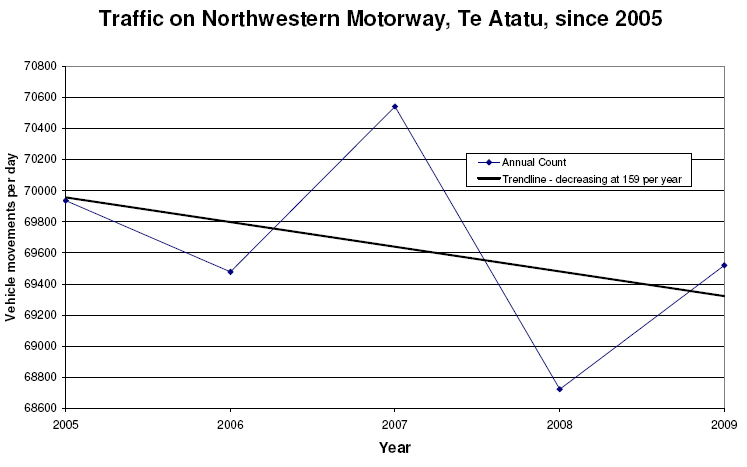 As far as pavement surface on the SH network, as per the CBT’s submission to NZTA/MOT in 2009, the damage increases dramatically on vehicles above 44 tonnes. Road surfaces will decline in quality rapidly once a lot of 53+ tonne trucks hit the roads. However, to quote Steven Joyce (Minister of Trucks) – there will be less trucks on the roads when we have larger trucks. Yeah Right! Interestingly there is an article in the Aucklander today about another harbour crossing, in it Tommy Parker from the NZTA is quoted as saying “The whole thing can be retained for 100 years [but] it can’t continue to absorb growth”. A comment about heavier loads on trucks: I’ve inspected all the bridges on the local roads in Whangarei District regularly for the last 12 years. There are several weight-restricted bridges and many others with long spans that would struggle, at best, with heavier loads. I’ll wager there are many more weight-restricted and marginal bridges on local roads elsewhere. Even if the bridges on the State highways are upgraded, virtually all trucks eventually have to leave the State highways and use local roads. Their destinations often include industries like quarries or forestry in remote rural areas. Our bridge networks, in particular, simply haven’t been designed for greater loads than they are already experiencing. I believe the proposal to increase loads on trucks is doomed to fail and/or cause a lot more damage than whatever benefit it yields.